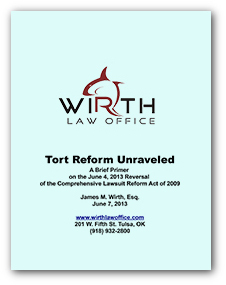 “Tort Reform Unraveled” in a printable pdf format. When the Oklahoma Supreme Court on June 4, 2013 struck down a landmark 2009 Tort Reform bill, it reversed law spread across 10 titles and 81 sections of Oklahoma Statutes. The order did not include references to the statutes created or amended by the now unconstitutional laws. Because the court didn’t reference those laws, until the legislature amends the statutes, those who rely on annotations in Oklahoma’s codified statutes will not be able to use annotations in relevant case law to identify the unconstitutional, unenforceable laws still on the books. For that reason, we’ve prepared a list of titles, sections and acts created and amended by the Comprehensive Reform Act of 2009. The citations in the left column below link to pages in www.oscn.net where the relevant laws can be read online. The downloadable .pdf report also contains hyperlinks to the related laws. Read more about the Supreme Court’s June 4, 2013 opinions in the related post Tort Reform Unraveled: Supreme Court Reverses 2009 Tort Bill. 12 O.S. §192 new indigent certificate of merit persons requesting indigent’s exemption from filing affidavit of merit must apply to court clerk, pay $40 fee, which may be deferred. 23 O.S. §15 joint and several liability eliminates exception from several liability where jointfeasor has less than 50% of liability and no comparative negligence by plaintiff. Clarifies that only jointfeasor jointly liable when liability arises from that jointfeasor’s willful or reckless conduct.